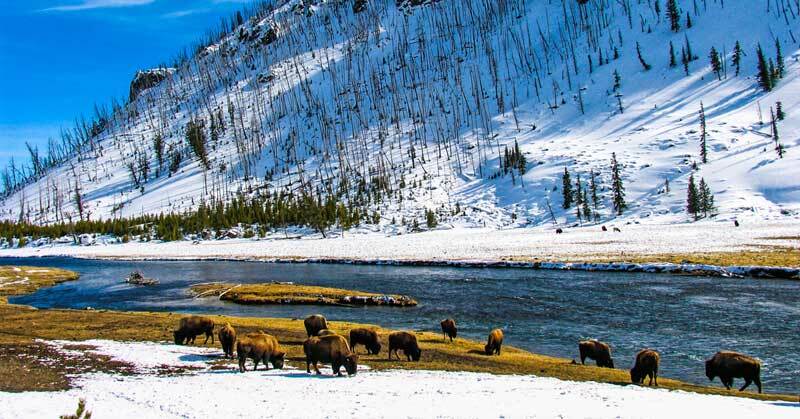 There’s no better time to visit Yellowstone National Park than during the winter months. 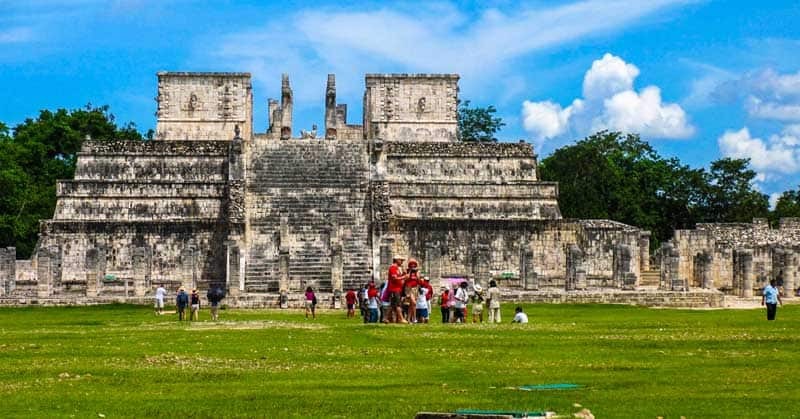 Then, you can trade the million a month crowds of July for a mere twenty or thirty thousand in most months between November and March. And better yet, the winter adventures in Yellowstone are unparalleled! But Yellowstone, like much of Wyoming and Montana, consists of rugged territory that’s hard to keep accessible over the winter. 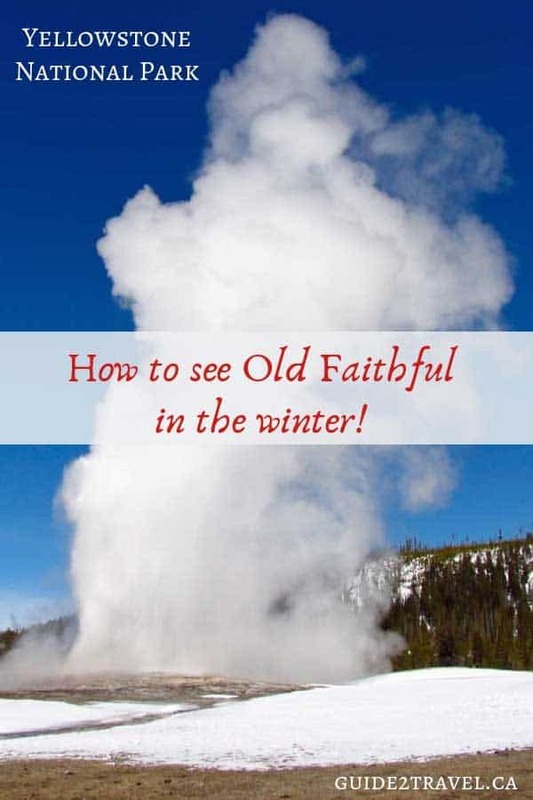 So, here are three ways to turn visiting Old Faithful, Yellowstone Park’s most well known feature, into an amazing winter adventure. Old Faithful in Yellowstone National Park erupting in the winter. Old Faithful is amazing at any time of the year, but frosty weather adds another whole new dimension. When we visited, white fluffy clouds poured out of Old Faithful almost as if some giant below ground was checking whether or not he could see his breath — but these were steam clouds from boiling water shooting around 145 feet into the cold air in Yellowstone National Park. The landscape, all but the last dozen yards or so to the geyser, was shrouded in snow. Nearer the geyser the snow gave way to melt water ice and then to ground. 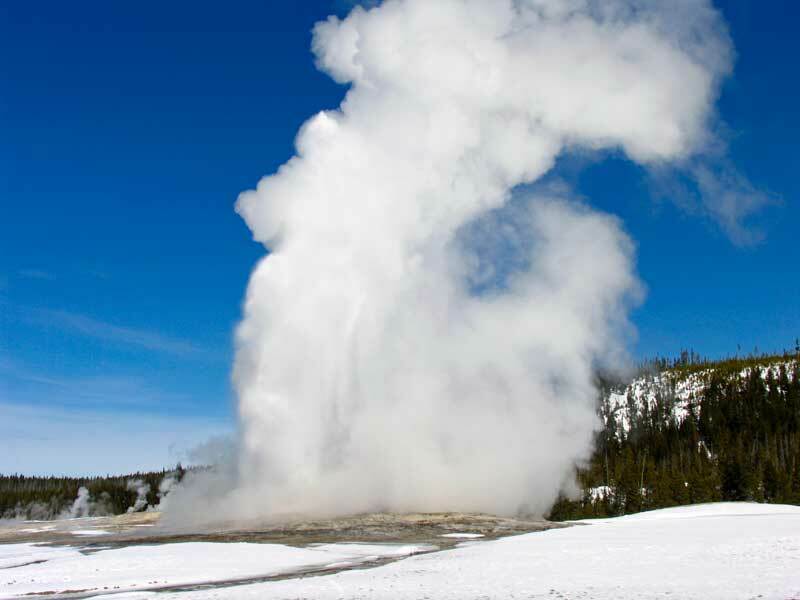 Nothing — certainly not winter — stops the world’s most predictable geyser. 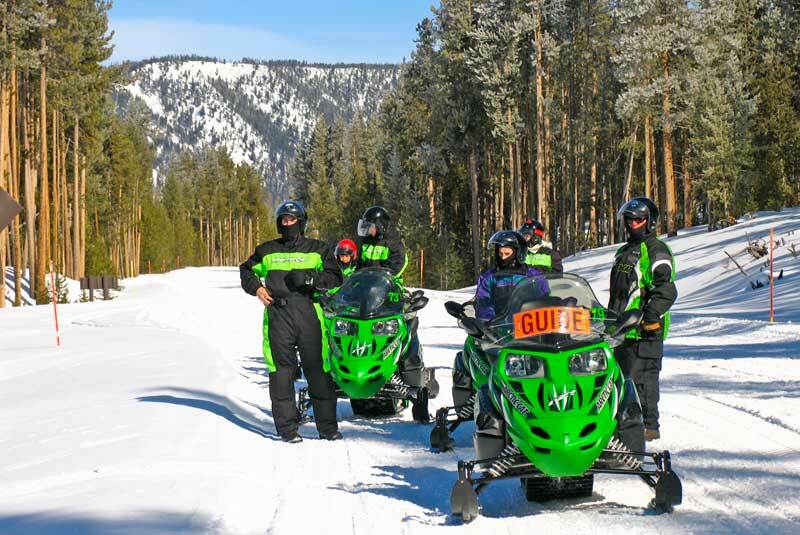 Snowmobiles with a guide in Yellowstone National Park. Like a number of other parks that don’t have full operation all year round, the majority of Yellowstone closes to vehicular traffic once fall ends. So, you just can’t get to Old Faithful by car or motorhome. And, in order to keep the park pristine, the number of snowmobiles are restricted. If you want to take your own snowmobile, you’ll need to apply for a permit in August through a park lottery system. However, the guided snowmobile tours are great and take care of all the details! And if you do want to take your own sled, the trails outside Yellowstone, leaving from West Yellowstone, are the ones you always hear about anyway. 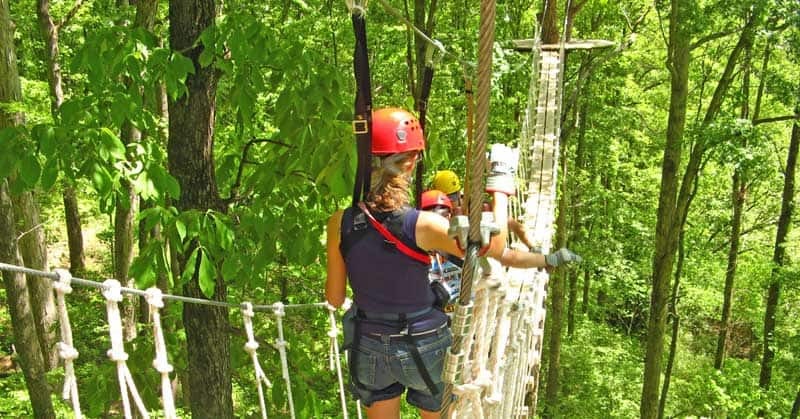 Our favorite was the Two Top Trail. 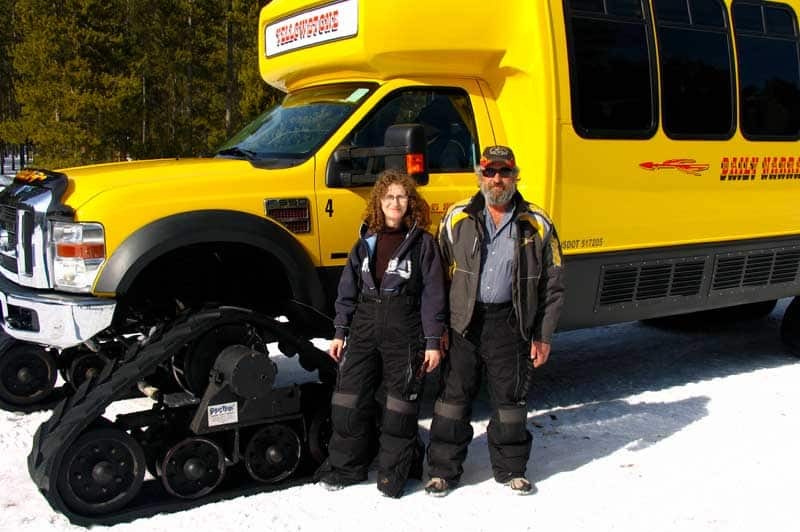 Linda Aksomitis & David Aksomitis on a snow coach tour in Yellowstone National Park. 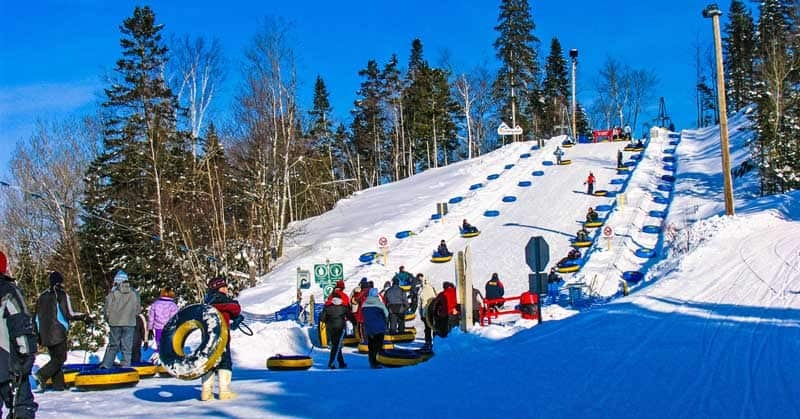 No matter what weather winter throws at you, you’ll be comfortable on a snow coach tour. Ours picked us up right at the door of our hotel in West Yellowstone, then headed for the West Yellowstone Gate into Yellowstone, one of the four that are open into the national park year-round. Yellowstone National Park sits on top of a “supervolcano,” which accounts for some of the geothermal activity and the rivers that flow without freezing over throughout the winter. In total, there are around 10,000 geothermal features. While only a limited number of them can be reached through winter travel in the park, it’s still a pretty amazing experience to view geysers, paint pots, waterfalls, and hotsprings with snowy background. Of course, your snow coach tour also includes a stop at Old Faithful. Bison grazing at Whisky Flats in Yellowstone National Park in the winter. Snow coach tours are guided by park rangers, so we learned a lot about Yellowstone and its inhabitants. In fact, more animals live in Yellowstone during the winter than other seasons, due to the availability of smaller prey, such as fish and small animals. Predators such as bobcats, lynx and mountain lions inhabit the park in relatively small numbers. Coyotes, wolves and red fox have plentiful populations, along with such large animals as bison, moose, deer and elk. Cross country skiers in Yellowstone National Park. Photo credit: Skeeze on Pixabay. 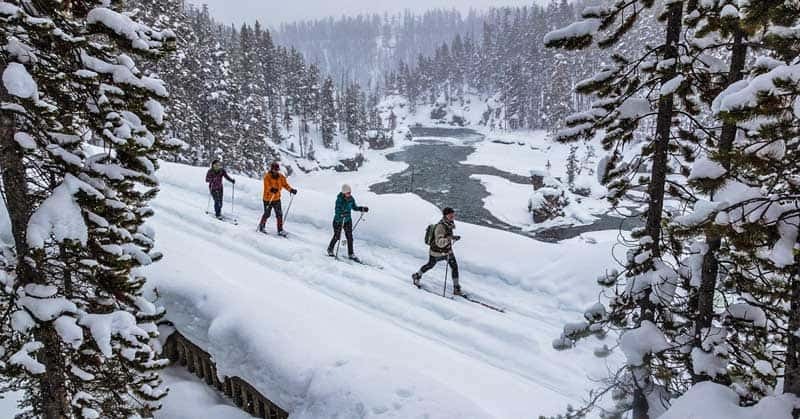 If you want to experience Yellowstone without the hum of engines, there are many cross-country ski trails to get you where you’d like to go. 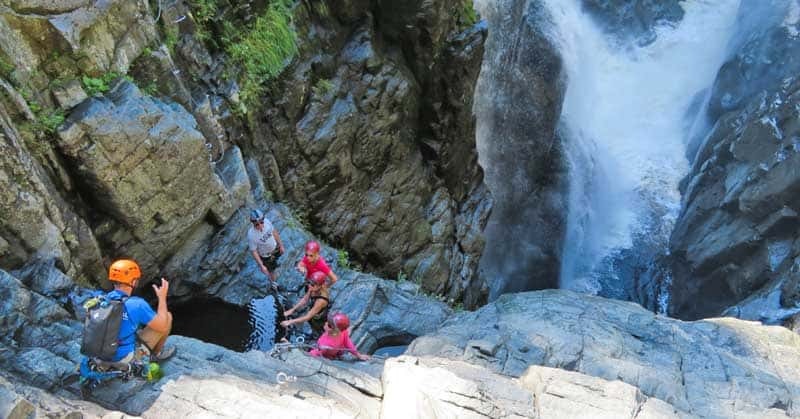 Trails are marked and rated by experience, so you can choose between easy, difficult and more difficult. While they’ll all be marked throughout the winter months, they may be untracked as all trails aren’t groomed. The Old Faithful area, as you might guess, is a popular one. 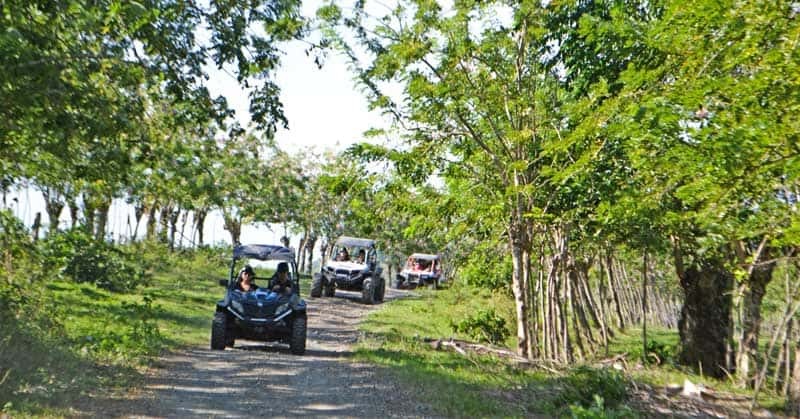 So, you’ll find forty miles of trails, some that are machine-groomed. 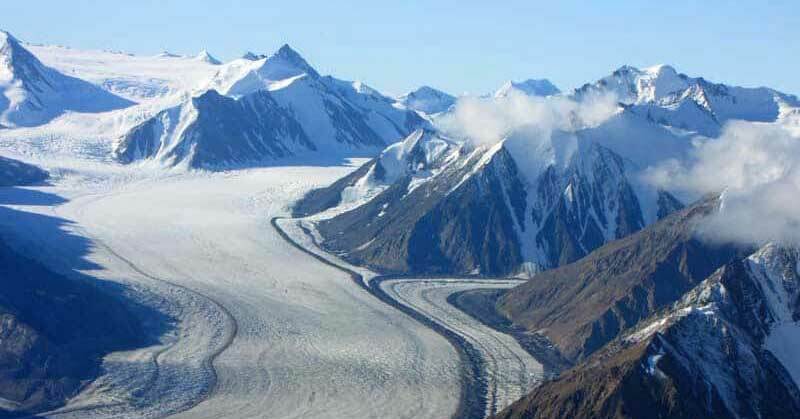 However, you can only get to them by taking a tour or arranging a snow coach drop-off. Many skiers make their vacation one truly off the grid, staying at the Old Faithful Snow Lodge and Cabins for several days. 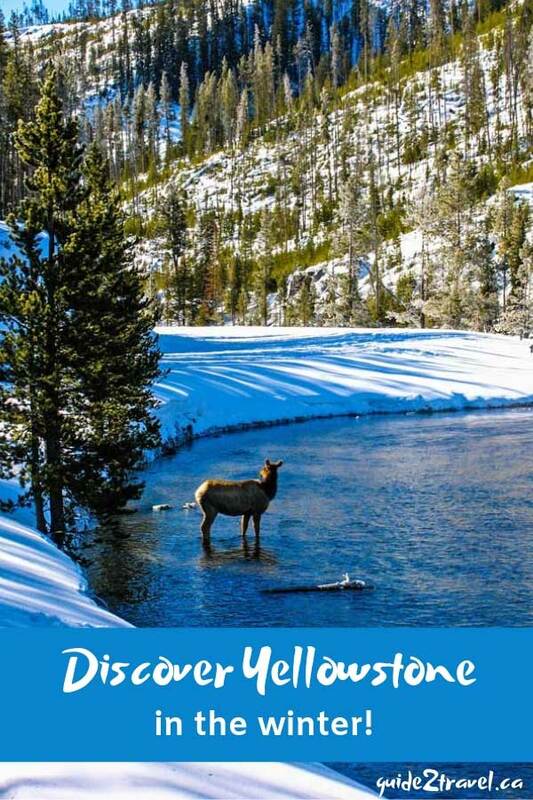 Excelsior Springs in Yellowstone National Park in the winter. However, you’ll also find ski trails throughout the park that are accessible by car such as the Gallatin and Cooke City areas. If you’d like to relax and experience a variety of well-groomed trails, you’ll find lots in West Yellowstone. 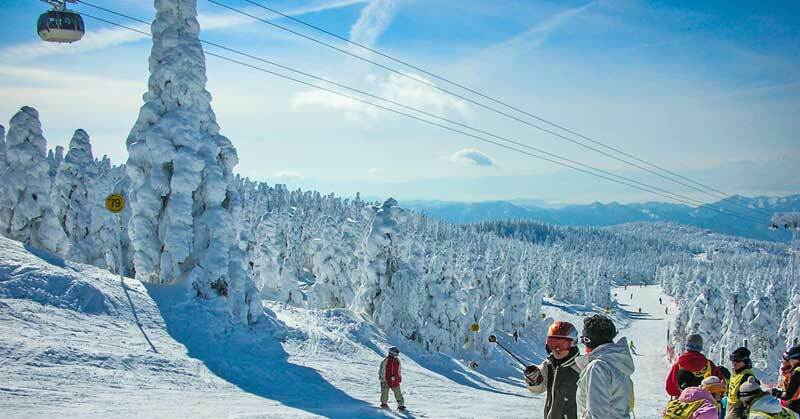 There, the Rendezvous Ski Center has over 21 miles of beautiful, rolling terrain for every level of Nordic skier. 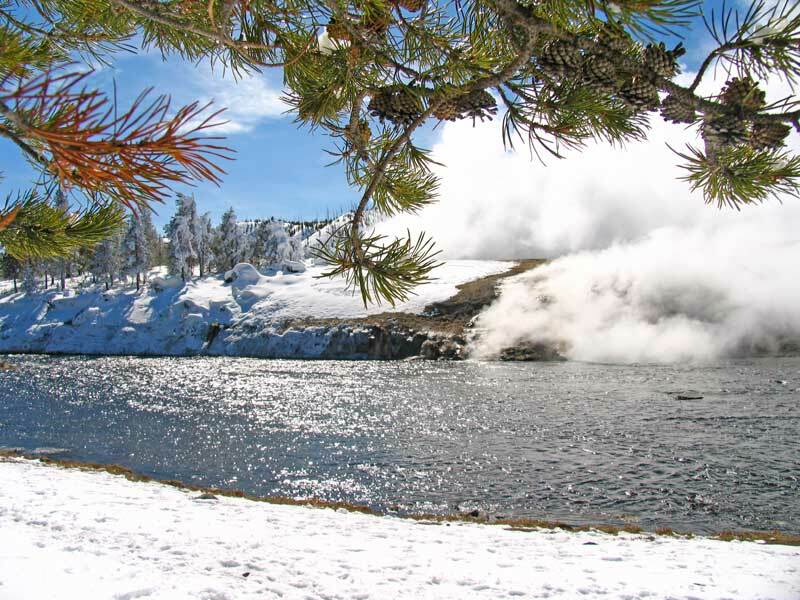 Cliff Geyser in Yellowstone National Park in the winter. On March 1, 1872, Yellowstone National Park became the first national park in North America. Most hold it’s even the first in the world. President Ulysses S. Grant created the park, signing it into law through the U.S. Congress. In 1978, Yellowstone was also declared a UNESCO World Heritage Site. Yellowstone has limited access during the winter to protect the environment, one of the mandates of the national park service. The road between Gardiner, Mammoth Hot Springs, and the Northeast Entrance/Cooke City is plowed year-round and open to the public. Snowmobiles and snowcoaches have access to more of the park than the Gardiner/Mammoth Hot Springs road. 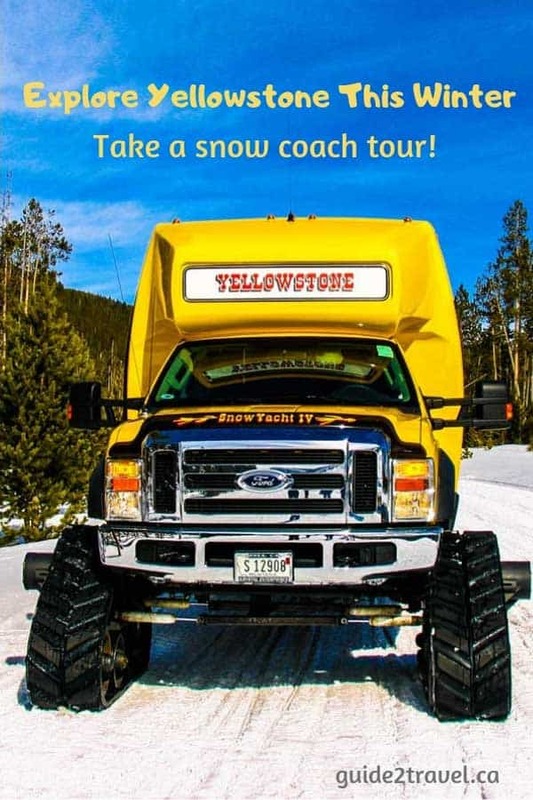 Multiple-passenger approved guided snowcoach tours provide access to Yellowstone. Firehole Bar-B-Que in West Yellowstone, Montana. Wondering about the Old Faithful Snow Lodge & Cabins I mentioned earlier? From a collection of 1920s cabins that grew into a complex, the snow lodge of today was built in the 1990s. If you’re thinking of fireplaces, a glass of wine and bison for dinner, then you’re on the right track. 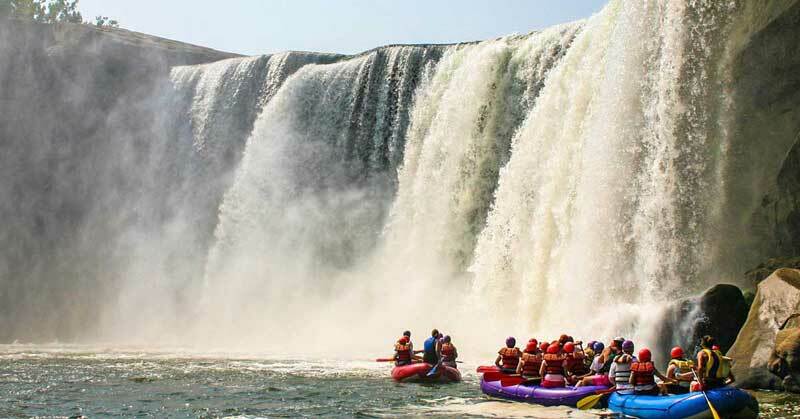 Daily tours provide opportunities to see the Grand Canyon of the Yellowstone in the winter snow or the Firehole Basin, just to mention a few. For a full range of accommodation and entertainment options, plan to stay in West Yellowstone. Our last trip we enjoyed a couple of very comfortable nights at the Brandin’ Iron Inn. It’s just a couple of blocks from the West Yellowstone entrance into Yellowstone National Park, so perfect for summer adventures too. Another thing we really appreciated about the Brandin’ Iron was how close it was to places to eat and relax. The Slippery Otter Pub, right across the street, had a great selection of micro drafts by the pint or pitcher. And our favorite meal? 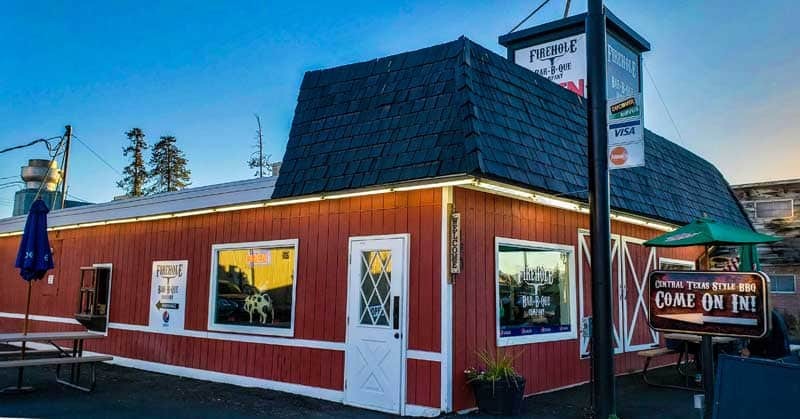 It was right across the street too, at the Firehole Bar-B-Que that served Texas-style meats. Delicious! Our stay at the Brandin’ Iron Inn and snow coach tour tickets were provided by the West Yellowstone Chamber of Commerce. 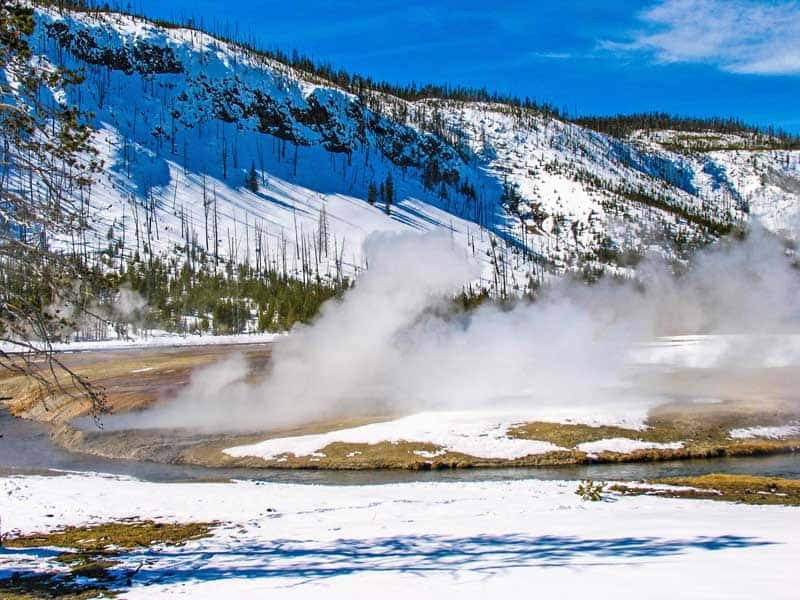 Old Faithful, the most famous geyser in the world, is amazing in the winter–here are three ways to get there when roads are closed. 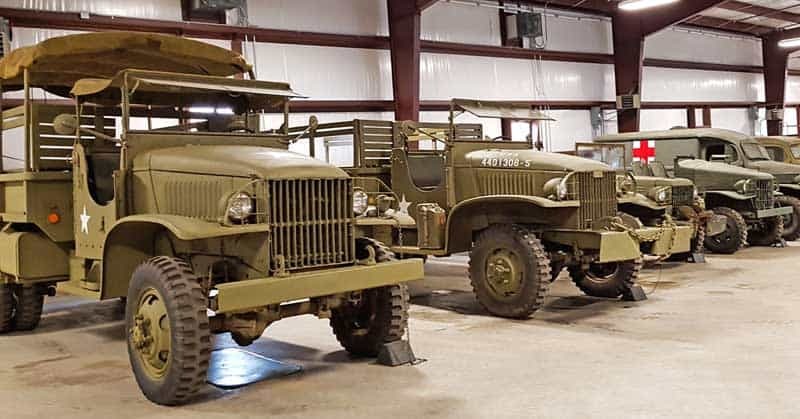 If you’re visiting Glacier National Park, you must make the 70 mile trip to see the Museum of America Museum in Polson & huge collection of Americana. Take a road trip on the Great Northern Highway to see the colors of the fall leaves in Glacier National Park, part of the UNESCO World Heritage site, Waterton-Glacier International Peace Park. Get a feel for the old west in the Montana Bar in Miles City, Montana. 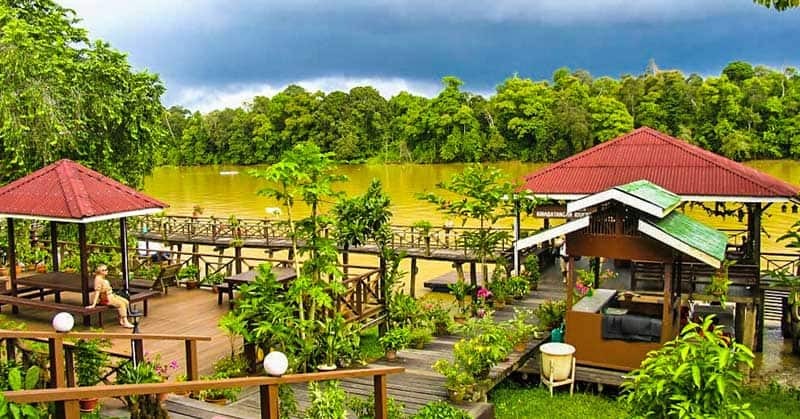 More than a century old and full of originals furnishings, it offers drinks & dining. 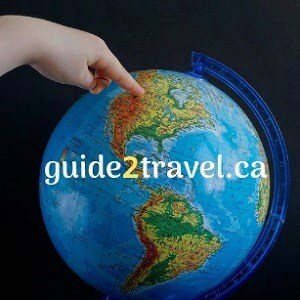 The photo in the header above, of Old Faithful, was taken in Yellowstone National Park, Wyoming, USA. Save one of these pins to Pinterest to share it with others if you enjoyed this story!